Okay, there were a few comments on both Amistore and IndieGo! Appstore blog entries that may clear up some issues I had at the time (I plan to revisit each when they are out of beta). 1) When selecting the platform, I could only scroll using the arrow keys. Apparently, if the mouse pointer is over the list, the wheel should work. He said selecting more than a single platform selection will be supported in the future. Full re-review when final versions come out. Audio cards were a luxury in Amiga computer. Apart from a few clockport models, it was the Zorro slot machines that gave the real high quality option. One of the oldest and most supported cards for Amiga was the Toccata soundcard. The sound controller IC is well documented. 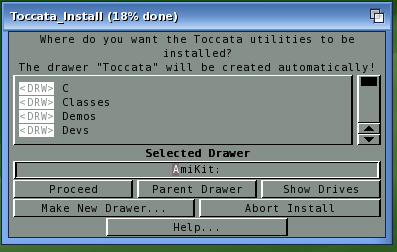 Someone pointed this out on the EAB WinUAE support page and Toni Wilen (fresh off the release of v3.0 of WinUAE, with PowerPC Support) decided to add Toccata emulation support. Why do this when the UAE sound support is already well handled? Well, why not? I downloaded the v3.1.0 beta 1 WinUAE on that support site and set out to see how it worked. but I ran into my first problem: The toccata.audio driver for AHI wasn’t included in the standard AHI that was part of AmiKit v8 (and I think it isn’t installed by default). 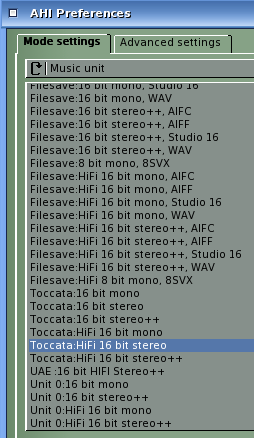 I manually pulled out the toccata.audio file for the DEVS:AHI folder and another settings file for the toccata card and put it into the right folder. 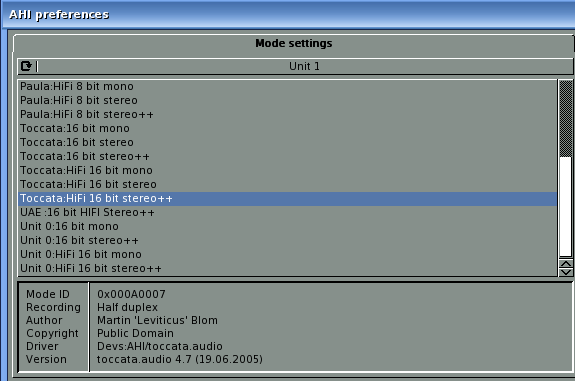 Then, after a reboot, I set up the AHI Preferences to use Toccata stereo 16. I then ran into a problem trying to run AmigaAmp. It was complaining that it couldn’t open AHI device. I eventually had to go redownload and reinstall ahiusr_4.18.lha from Aminet.net and this fixed that. I had tried to set up Toccata as unit 1 and leave the UAE sound device as unit 0. I eventually had to set Toccata stereo++ as unit zero and change AmigaAmp settings to use AHI unit 0. I was then able to get some sample mp3’s I’d downloaded to play using AmigaAMP. So, what is the advantage of using emulated Toccata? Not sure yet for a WinUAE user unless there exists some software the specifically uses the Toccata, but I thought it was cool to use.